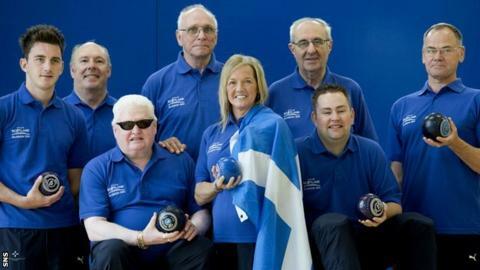 Scotland have added seven Para-Sport competitors to their lawn bowls team for the Commonwealth Games. Billy Allan, Michael Simpson and Kevin Wallace make up the B6/B7/B8 triples team for Glasgow 2014. Directors are classed as athletes for the first time and will be eligible to receive any medals won. Para-Sport lawn bowls is on the Games schedule for the first time since 2002 in Manchester, where David Heddle, Ivan Prior, John Robertson won the triples gold for Scotland. Kelvingrove Lawn Bowls Centre will stage all of the events and Allan, Simpson and Wallace have good memories of the venue, having won the 2013 Eight Nations Commonwealth Invitational Championships. Wallace and Simpson have also had success at the last Bowls for Disabled World Championships in 2011, when Wallace won gold in the singles and a bronze in the pairs with Simpson. Conway won gold at the 2013 International Blind Bowls Association World Championships and, together with Edgar, won bronze in the pairs event.